Delhi Dynamos registered their first win of this year's campaign against the reigning Champions Chennaiyin FC at Jawaharlal Nehru Stadium. The scoreline read 3-1 which saw the majority of the fans heading towards the exit door with total agony as the home team sits last in the League table currently. John Gregory's side started the game very brightly, but it was the visitors who took the lead through the young Daniel Lalhlimpuia and netted his debut goal for the club in the 16th minute. Delhi struggled to keep the ball throughout the half and gave away cheap possessions in the dangerous area. The Blues striker Carlos Salom who looked very much involved in the game won the penalty six minutes before the half-time which was calmly converted by Raphael Augusto. Just when Chennaiyin FC looked to be pushing for the winner, they were caught on the counter by the ex-blue Bikramjit Singh who made it 2-1. Four minutes later, Nandha Kumar took a shot outside the box which was deviated by the Skipper Mailson Alves into his own net. It was a night of misfortune for the Blues who had no luck whatsoever throughout the game. Comparatively, Chennaiyin FC did put in a good performance today, but they were undone by the lapse of concentration. Josep Gombau will feel that the visitors worked enough to secure all three points. On the other hand, John Gregory would be gutted to lose another game despite putting in a spirited performance. 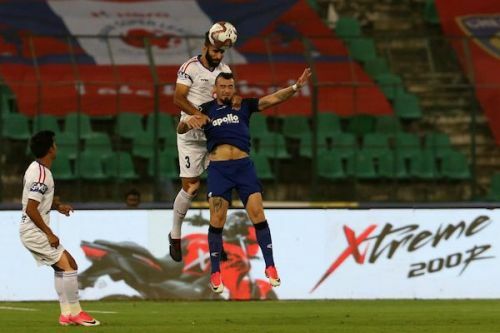 In this piece, we shall look at the top five talking points from the game between Chennaiyin FC and Delhi Dynamos FC. Raphael Augusto was running the show in the middle of the park for Chennaiyin FC. The hosts looked blank when it came down to the creative part of the game. The Brazilian was extraordinary through the first half and did well during the tiny parts of the second half. He was the best player on the pitch by a mile. After going a goal down early on in the game, Carlos Salom earned a penalty which was converted by the Brazilian to net his second goal of this campaign. He should have added two more to his tally when his extraordinary free-kick was kept out by the Delhi shot-stopper Francisco Dorronsoro, and he missed a sitter from inside the six-yard box to make it count. It was a test passed in flying colours, and John Gregory will be taking notes of the Brazilian's performance to constantly motivate him.